The famous Barbie turns 55 in 2014, which gave occasion to inspire Russian designers to devise a whole new wardrobe for the doll. Six Russian designers—Alena Akhmadullina, Kira Plastinina, Alexander Arutyunov, Anastasia Romantsova, Oleg Ovsiyev and Natalia Goldenberg—took up the challenge. They picked the best models from their newest collections and made miniature replicas of them. Anastasia Romantsova's representation of Barbie was in a dress made from an Orenburg shawl, while Alena Akhmadullina chose an aurora borealis dress paired with a large fur cap. Alexander Arutyunov went for a light, summer style with a brightly colored skirt. Oleg Ovsiyev, a designer for Viva Vox fashion house, gave the birthday girl a red, one-shoulder, floor-length dress with a fishnet print. Kira Plastinina, a designer who started her career creating apparel for her favorite doll, also chose a red outfit—a rich, velvet gown. 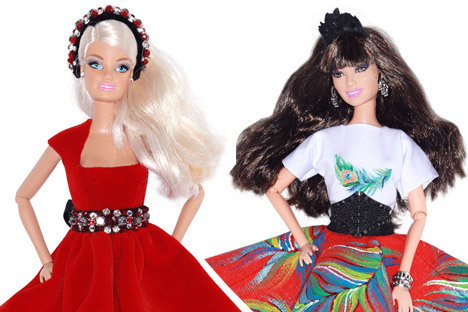 The new doll collection will be available for sale during the 2013 International Charity Bazaar, and the money raised from the sale of Barbie dolls clad in Russian designer outfits will be given to charity. Based on material from Woman.ru and Ural56.ru.